Barnstorm is a student-run production company that was established in 2004 by the UCSC Theater Arts Department, in order to generate more production opportunities for students, and to ease the transition for undergraduates from academia to the professional theater world. Every year since it's establishment Barnstorm has presented a season of one to three quarters, with productions and projects proposed by students and faculty, and chosen by the managing team of graduate students. It has produced and hosted original student work, previously published shows, dance shows, collaborative pieces between faculty and students, one-nighters, improv and sketch comedy, 24-hour theater, educational workshops, and more. Barnstorm has since its inception fulfilled needs of the students, to present production opportunities beyond the quarterly offerings of the Theater Arts Department, to allow students the chance to experiment with and create their own innovative theater, and to give students a taste of operating and creating art within a professional theater company. The first class meeting is at the beginning of the quarter. Please contact the Barn Theater Directors for the date. Barnstorm creates opportunities for the developing artist to re/claim theatre and the theatrical process. Our aim is to integrate our perspectives into the political, social, cultural and academic climate of the UCSC campus and community. We are devoted to fostering new works of art and giving artists and audience alike opportunities for exchange through a theatrical setting. Click here to listen to a message from the current Barnstorm directors! Proposals for shows, productions, and other projects for Barnstorm are due toward the end of the quarter for the following quarter. You may contact the Theater Arts Department office for information on upcoming proposal deadlines. Barnstorm typically produces 2-3 full productions and numerous one-nighters during the quarters in which it operates. Auditions for Barnstorm's full productions happen during the beginning of the quarter. Auditions for one-nighters are usually held separately, later in the quarter, and organized by an individual show's director and the Barnstorm Management. Designers and stage managers may contact Theater Arts Department office for positions ahead of time, once the season has been announced, or else show up to the Barnstorm Information Meeting, generally held the first Monday of every quarter, after auditions and casting. Students may also apply for other positions and opportunities at this meeting, such as Publicity Manager, Webmaster, and more. All students involved in Barnstorm must enroll in Barnstorm as a class. Students may enroll in Thea 55A, a 5-unit class, for 150 hours of recorded work, or Thea 55B, a 2-unit class, for 50 hours of recorded work. Students fulfill these hours with work on their primary show or project, support calls (acting as crew, ushers, publicity distributors etc. for the company. Students in Thea 55A are required to fulfill 2 support calls per quarter, students in Thea 55B one), and attending Barnstorm shows. Units in Barnstorm do not count toward the Theater Arts major or minor, but can be counted towards graduation. 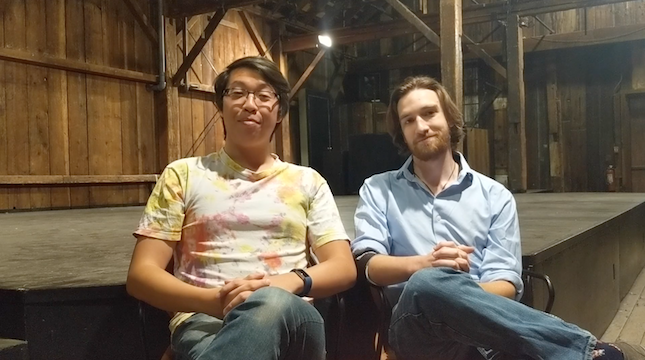 Barnstorm Management is made up of 2–3 graduate students in the Theater Arts. Undergraduates interested in becoming future Barnstorm Managers should contact the current team about acting as assistants to gain more experience, and would apply as part of the application to the UCSC Theater Arts graduate program to run Barnstorm. For more information on the current or upcoming seasons of Barnstorm, you can contact the Theater Arts Department, or Barnstorm directly.